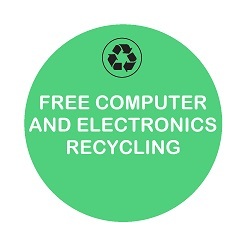 We are dedicated to recycling all E-waste and IT related electrical equipment in an environmentally responsible way. Totally Free recycling services and a dedication to privacy. All Commercial and Domestic related computer & electronic / electrical equipment included. Servicing the Hamilton City and Waikato District area for free, (some volume conditions may apply, please ask). We accept almost anything related to electrical equipment regardless of age or condition, (Anything powered by electricity/ battery’s etc). We also accept Cell phones, cords, chargers etc and most household items including Stereos / LCD monitors and TVs / DVD players / VCRs / Cables and most other small electrical appliances. Workshop tools are included, (Domestic and Commercial). We aim to Recycle EVERYTHING regardless of age, in an economical and environmentally viable form with an absolute minimum of wastage. Our preference is to Refurbish as much IT gear as reasonably possible and get it back in usage, rather then simply strip it down for scrap. Privacy is assured with Professional grade data wiping and or device dismantling /destruction services. Equipment that is in good working condition but cosmetically damaged, will often be gifted after workshop processing, to various local Help Groups for their members.